Posted on April 2, 2014 by Ronald Patrick Raab, C.S.C. 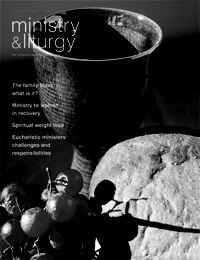 Read my latest article in Ministry and Liturgy Magazine for April 2014. I enjoy meeting people in diners, coffee shops and hangouts. I use coffee shops as places to hear people’s complaints about their family members. I listen to a young post-grad describe falling in love during lunch at my favorite diner. These places are not just a place to sit and to eat or drink. Food is not just function. They are places of profound conversation that open people to the truth of their lives. I have moved ten times since my ordination, living in places as varied as Southern California, Chicago, Portland, and Colorado Springs.. I can often describe my ministry by my hangouts where I meet people for conversations. Some of the eating establishments have also been on-site confessionals. I hear sins and offenses scrambled together with eggs in the early morning. Some bar stools have been places of spiritual direction for me where I have poured out my heart to other people over drinks or coffee or dinner or ice cream. No matter the city, conversation around food and drink creates a safe place where stories are told and matters of conscience are talked about freely and lovingly. In fact, as I ponder these personal conversations, I believe I have had the most intimate and profound conversations of my adult life in these local dives or hangouts or even in a few elegant dining rooms. As we approach the celebration of the Solemnity of the Most Holy Body and Blood of Christ, I am aware that we all need our daily bread. Our hunger is real for intimacy, or to be heard or to share our stories with other people. Our hunger is not static or just other worldly or confined to church pews. We are starving for God’s love. I realize with every move around the country that we all need people on earth to receive our stories of doubt, sin, insecurity, anger and sadness. We need to become food for one another; partaking of the Eucharist in our own lives in order then to receive the hunger of other people. The Solemnity of the Most Holy Body and Blood of Christ is lived in the world when a sleepless parent feeds a screaming newborn in the darkness of night among the bonds of family love. I view the Eucharist when an elderly woman spoon-feeds her husband of nearly sixty years who is dying of a brain tumor. This intimacy is unmistakable. This is God feeding us when we are called to feed those we love no matter the circumstances. This Solemnity also challenges us to become a real presence of love for people we do not know. We may stumble over our excuses not to offer a sandwich to someone who holds a sign for help at a local street intersection. We may cringe when a pastor suggests we take our youth group over to a soup kitchen on Friday nights. The challenge for us is to move beyond our places of feeling satisfied, of feeling full and powerful. We are all called to feed from our need for God, our powerlessness, our human emptiness, in order to really experience other people’s starvation and insecurity. We receive the sacred presence of Christ in Bread and Wine deep within our human ache for love and intimacy. This presence is then lived in the world in places we least expect. We must realize that our hunger binds us one to another. The Eucharist feeds us no matter our hardship or suffering, no matter our blindness to our neighbor or our sinful past. Food heals when we share it in mutual respect, when we are present to another person’s brokenness and pain. As we listen to the Sunday gospels just beyond this Solemnity, we hear Jesus’ gift to Peter. Peter recognizes Jesus’ place in the Kingdom of God. Upon this recognition, Peter is given his special place on earth. Our continued response to Jesus’ real presence here on earth opens us all up to great love and service among God’s people. Jesus’ real presence is often hidden from the learned and the clever. These gospels continue to open us to the fact that love is given to those who are burdened and lowly. The invitation to Christ’s love comes in the Holy Eucharist. We live out this love in Christ in all we do and in all we hope to become. This invitation of rest and consolation continues from the heart of Christ to those who are starving for hope, intimacy and healing. The Holy Eucharist is not about a convenient Mass time on a weekend or something that is external to our daily lives. This real presence of Christ Jesus is an everyday life of values, a belief system that all of life is holy and a revealed hope among all people who starve for holiness and the basics of life. The Eucharist challenges us to become a sacred and real presence in the world even among strangers we meet at a local diner or among our family over a home-cooked meal. Sharing our stories in love and faith with food here on earth opens us to the healing of Christ Jesus, our food from heaven.